After sealing major connectivity deals this year, the Department of Information and Communications Technology (DICT) is ready to set the National Broadband Plan (NBP) in motion with a pilot run of the National Fiber Backbone in the final quarter of 2018. 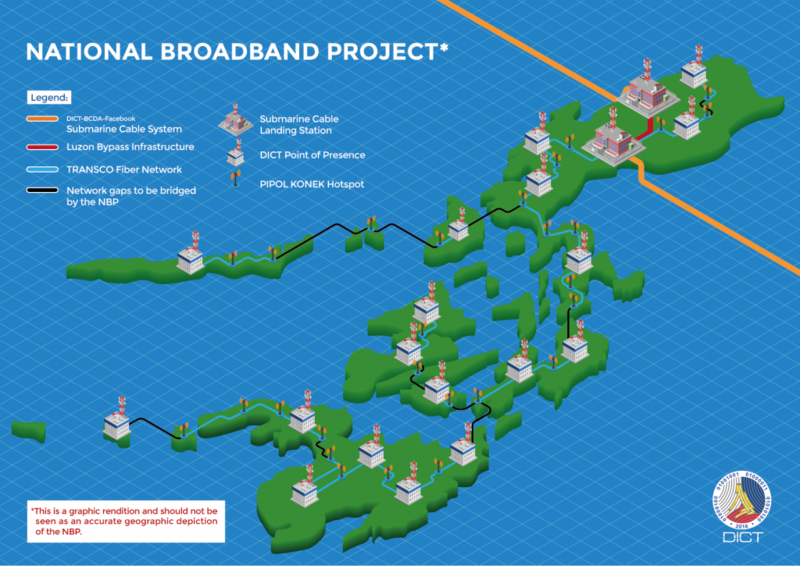 The pilot project implementation, installation and testing is scheduled on November-December 2018 to light up portions of the 6,154-kilometer dark fiber network of National Grid Corporation of the Philippines (NGCP) and showcase high-speed internet to Government Network (GovNet) and Pipol Konek Free Wi-Fi in Public Places beneficiaries. “This signals the dawn of fulfilling our promise to the Filipinos in providing them with better connectivity,” said Acting Secretary Eliseo M. Rio Jr. Seven point-to-point routes in Benguet, Tarlac, Pampanga, Batangas, Mindoro, Albay, Camarines Sur, Cagayan, and Bohol were identified for the pilot project, which is aimed to test both the integrity of NGCP Optical Groundwire (OPGW) and the latest optical transport technologies in the market. The said pilot run will also serve as the prototype for the utilization of the National Fiber Backbone, which was greenlighted after the DICT signed a Tripartite Agreement with NGCP and National Transmission Corporation (TransCo) last June. A crucial element of the NBP, the TransCo-owned backbone grid is being prepared in anticipation for the completion of the Luzon Bypass Infrastructure (LBI) next year. The backbone will serve as distribution network for the 2-million Mbps of data capacity coming from the state-owned international landing stations. The DICT has submitted a 2-billion proposed budget for next year to gear up the acceleration the NBP’s implementation, including the utilization of the backbone network. The Department considers the NBP as the missing link to boost connectivity across the archipelago within a shorter time as it aims to tap existing ICT infrastructures, which saves government significant time and money while ensuring huge economic return, projected during the Duterte administration.